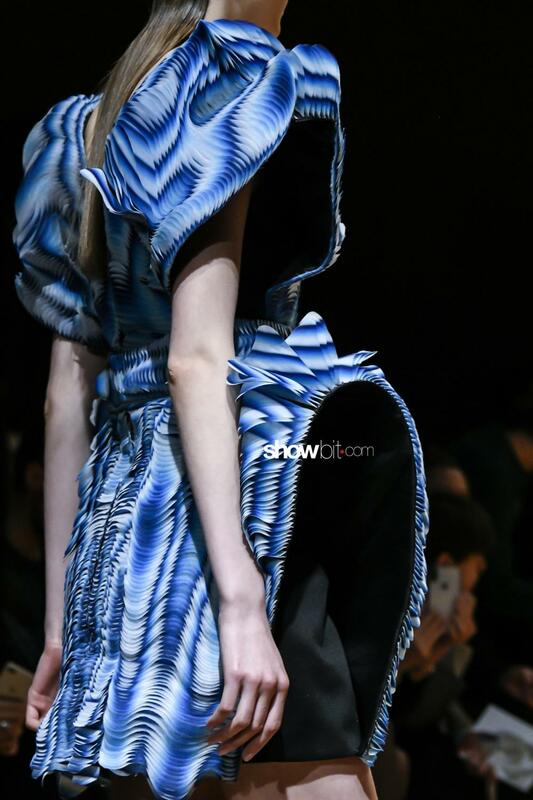 If art can reproduce -or even anticipate- a world that society still dreams about, a moment of poetical escape from reality is offered by Iris Van Herpen‘s fashion, bringing us to what the mythological dreams of humankind were about since the dawn of civilization. 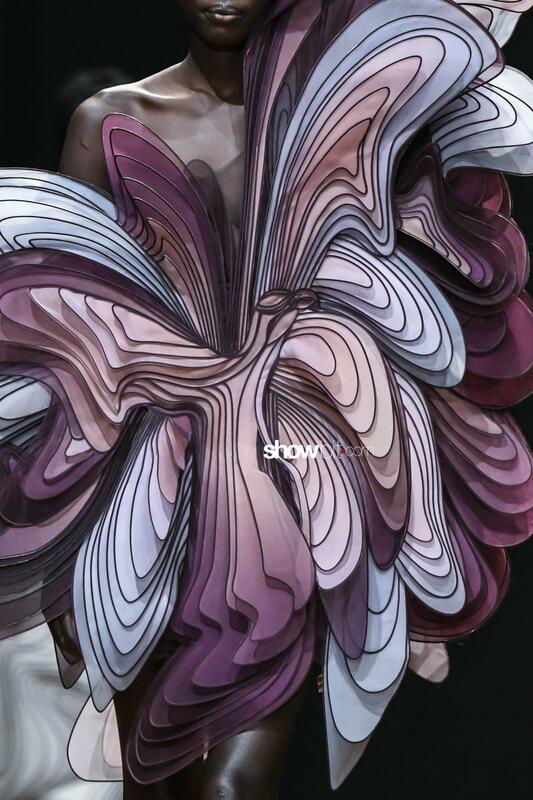 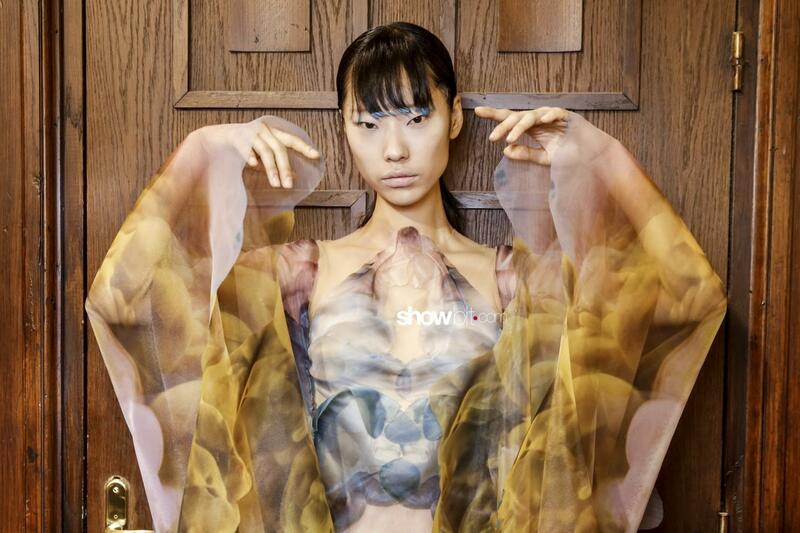 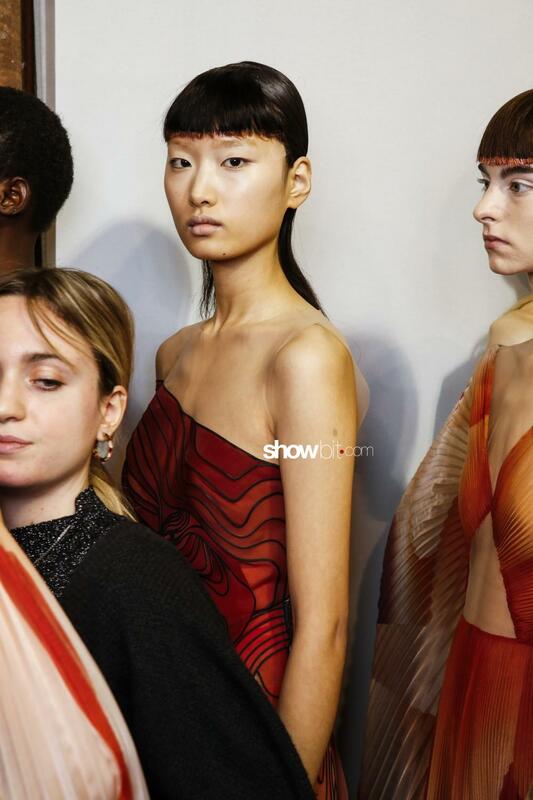 A hybrid woman is the cornerstone of the Spring 2019 Couture collection: a digital, scientifically created body, fused together with the immaterial and ephemeral mythological Japanese chimera. 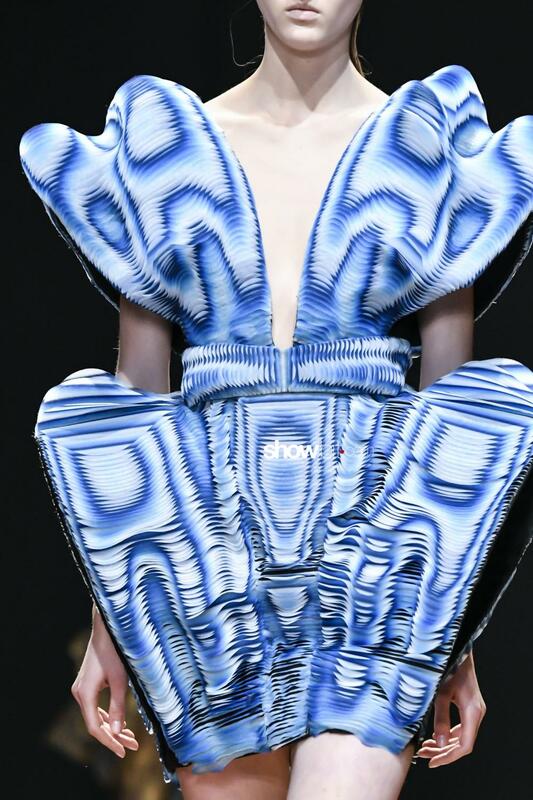 Iris Van Herpen wants to explore the engineering of the “Cybrids”, human hybrids whose scientific and ethical implications are still unclear, but already a reality we have to face. 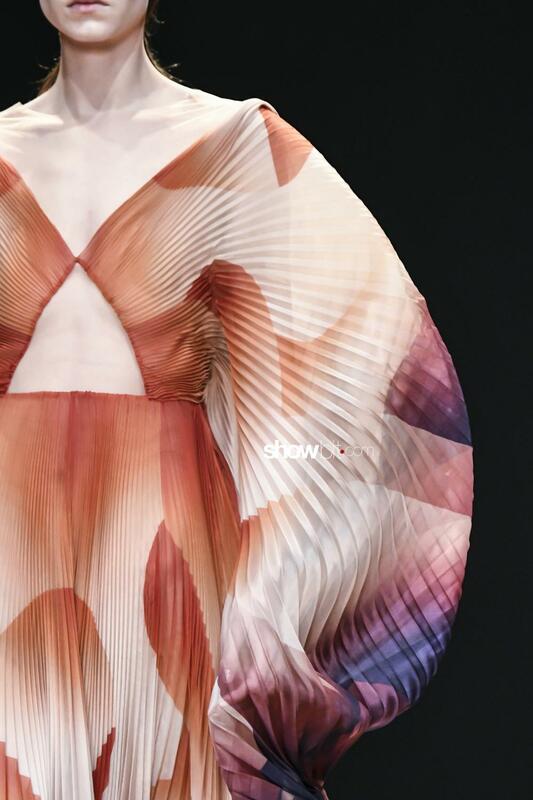 The technological techniques and materials earned the Dutch designer the reputation of one of the most forward-thinking and innovative fashion designer. 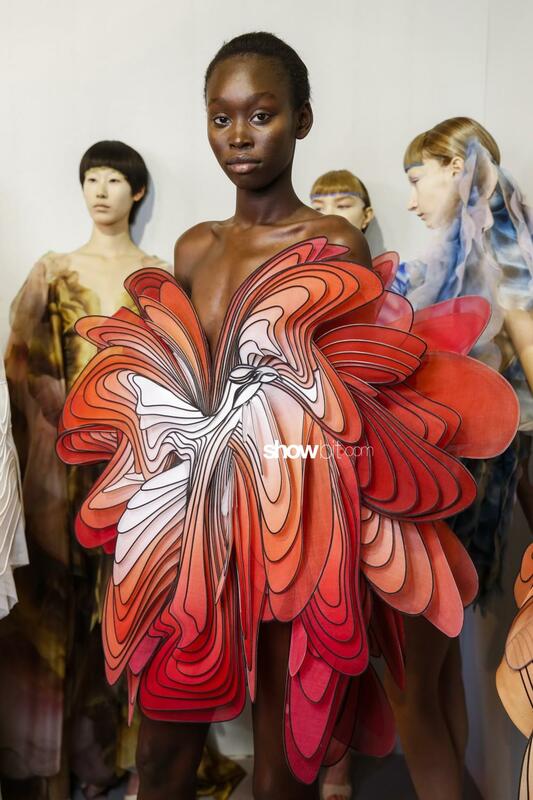 For her latest Couture collection, celestial cartography is the inspirational source, especially Harmonica Macrocosmica, a star atlas published in 1600 by the German-Dutch cartographer Andreas Cellarius. 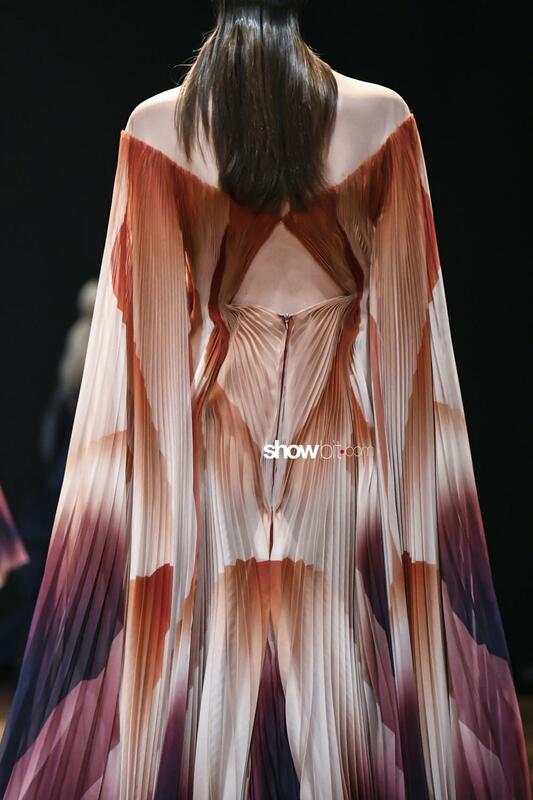 The body shapes are mapped and dissected, reproduced by sculptural volumes made of layerings of dégradé-dyed silk and organza. 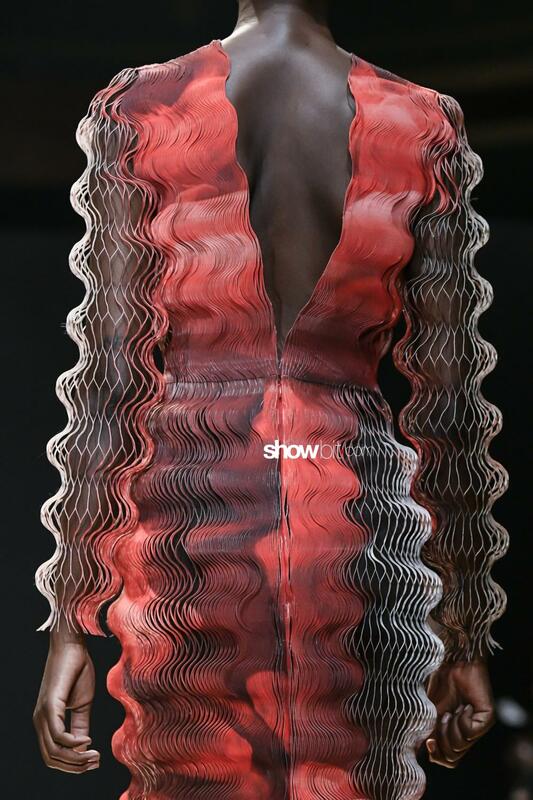 Plissé weightless surfaces are heatbonded with lasercut mylar, in order to shape into ethereal and dreamy dresses that create an illusionary dance of “harmonica waves”. 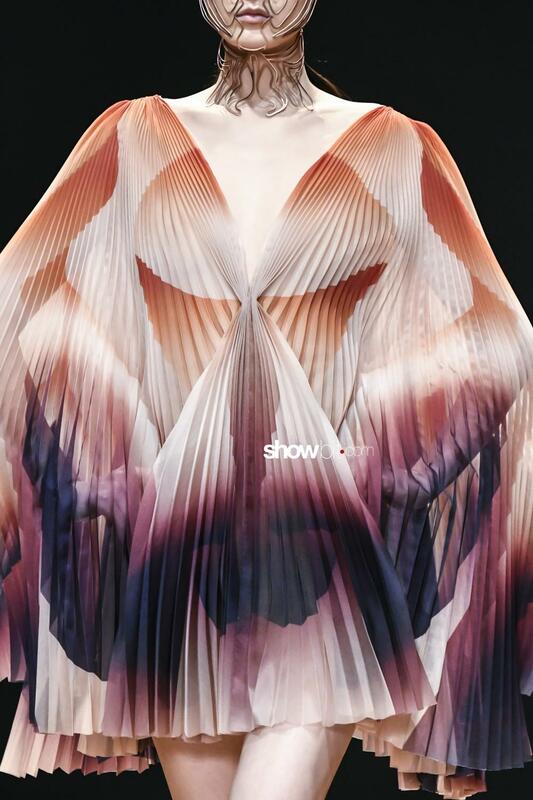 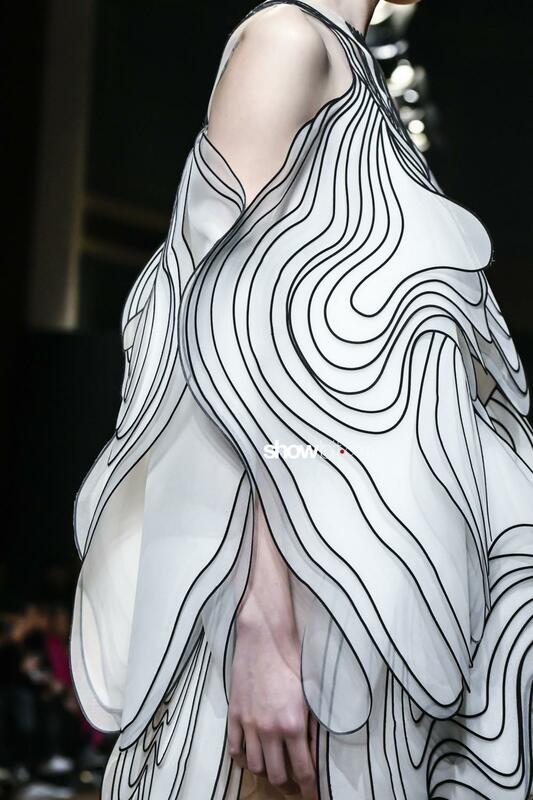 Balloon sleeves linger in the air in symbiosis with the body, like the wings of a bird; an abstract face is optically distorted on a multi-layered dress, creating a surreal and spectral effect. 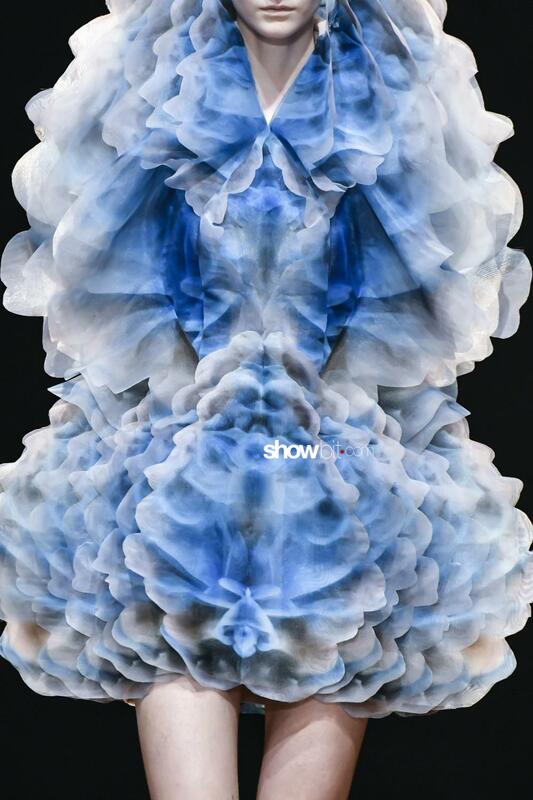 The collaboration with Kim Keever – a former NASA engineer and now an acquatic expressionist painter who works with large scale photographs of liquid clouds of colour – was crucial for creating translucent layered cloud dresses. 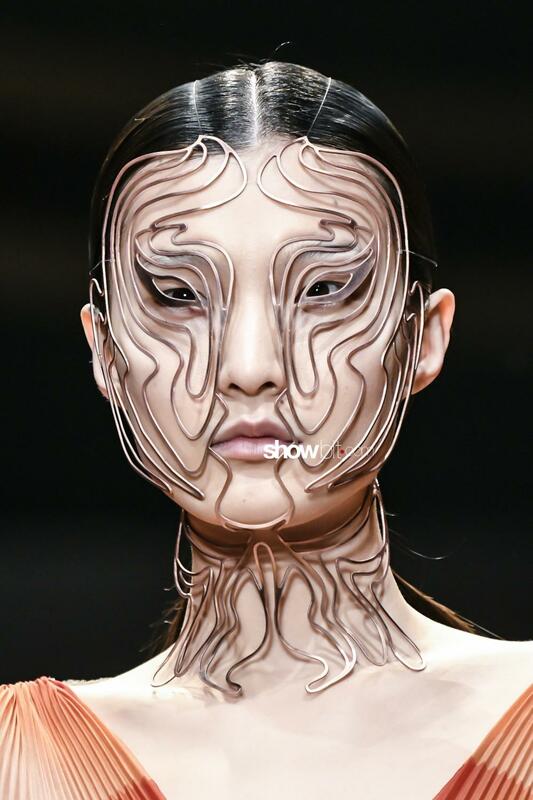 Some generative designs based on a 3D face scanning, the “Cellchemy” face jewelry pieces, were created instead in collaboration with the Delft University of Technology. 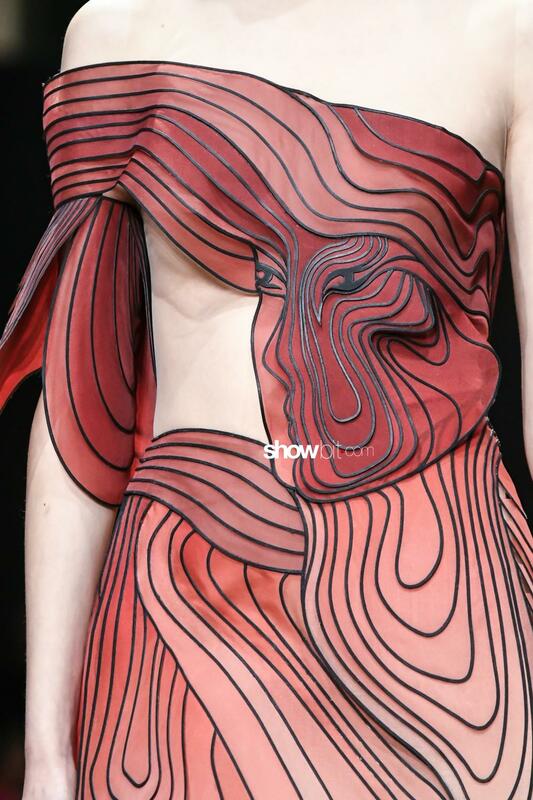 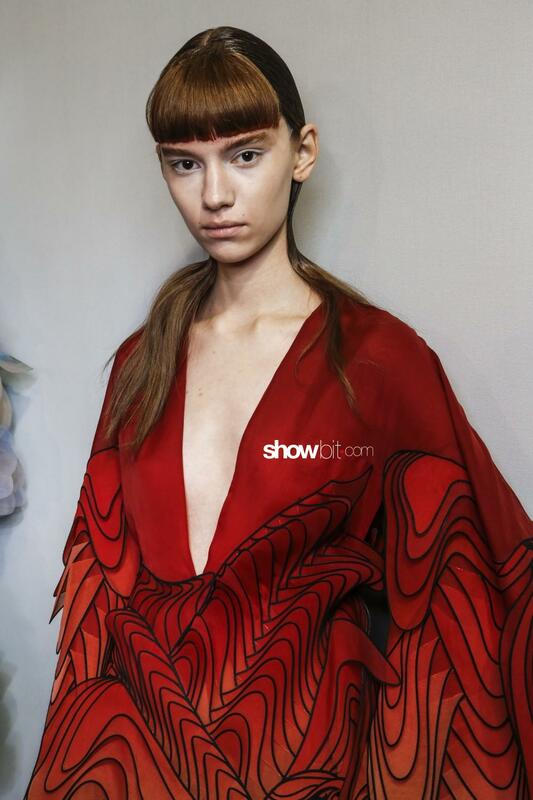 Take a look to our close-up and backstage images gallery from Iris Van Herpen’s fashion show!